I just added a new plant to my indoor plants collection. 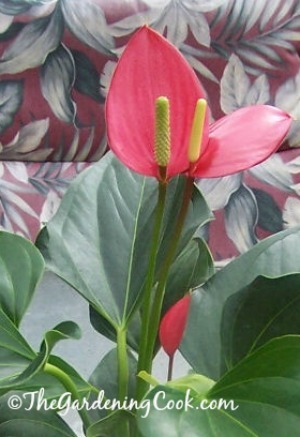 It is a plant from the anthurium family called Flamingo Flower. My greatest love is outdoor gardening. I work at home and I am very busy with my various businesses, so I tend to forget my indoor plants a bit. I only have a few and most of them end up outside for most of the year. I picked up this lovely specimen yesterday in the garden area of Home Depot. It is in tip top shape and I couldn’t resist it. 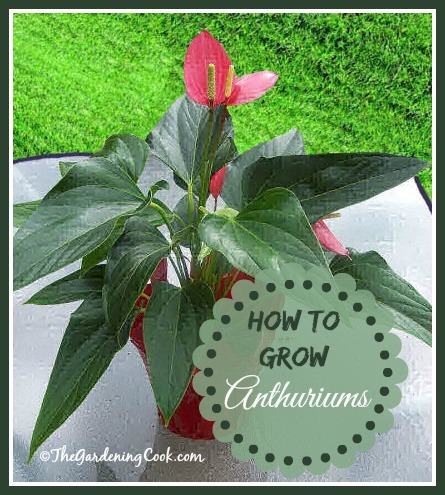 If you love to grow flowering houseplants, especially those with very showy flowers, anthurium is a great choice, even for beginners. Flamingo Flower is a tropical flower plant which thrives in low light. This makes it perfect for my north facing window in the dining room. It is one of the few low light plants that will actually flower in normal indoor conditions. As you can see from the photo below, the blooms are a true delight. The foliage is also appealing. It is glossy and dark green and will live happily for many years if you give it the proper care and maintenance. I have had this plant growing for well over a year and it keeps flowering and is still in wonderful shape. I consider this a real stamp of approval, since I am mainly out IN the garden and often neglect indoor plants. This one is a keeper! Flamingo flower plants are very easy to grow. Here is how to get the most out of it. Light Conditions. The plant likes bright, filtered light. Ideal for indoor low light conditions. Avoid direct sunlight. Height. It varies from plant to plant. My specimen is about 14″ tall including the pot. Water. Water once or twice per week, or just enough to keep the soil moist. Don let it stay wet for prolonged periods. Watering can be reduced in the fall and winter months, but the soil should never be allowed to dry out completely. Just put your finger in the soil down to the first knuckle. It it is dry there, it needs watering. Fertilizing. Use a high phosphorus fertilizer once a month during spring and summer. In the fall and winter, once every 6 weeks should do the trick. Humidity. In order to thrive, the Flamingo plants needs high humidity. You will lose the glossy texture of the leaves if the humidity gets too low. To raise the humidity around the plant, place pots on trays filled with moist gravel or pebbles, mist several times per day with lukewarm water. If you can’t find Anthuriums locally, our Affiliate Amazon has them for sale. Do you have other low light plants which flower well for you indoors? Please leave a note of them in the comments section below.